Good design is indispensable to industrial process facilities. The clothes we wear, the automobiles we drive, the electricity that powers our machines and cities are all extracted, manufactured, or assembled in a plant or facility before reaching market, so we owe all modern conveniences to their reliable functioning. Every day, plant designers and engineers solve for challenges around design and construction to address safety issues, operations efficiencies, and risk aversion. Maintaining safe and optimal operations is a top priority regardless of industry, ranging from food and beverage, water treatment, and pharmaceuticals to manufacturing, oil and gas, chemical, power, and mining processes. Plant design technology helps them accelerate plant project delivery and deliver better facilities that respond well to ever-changing needs. 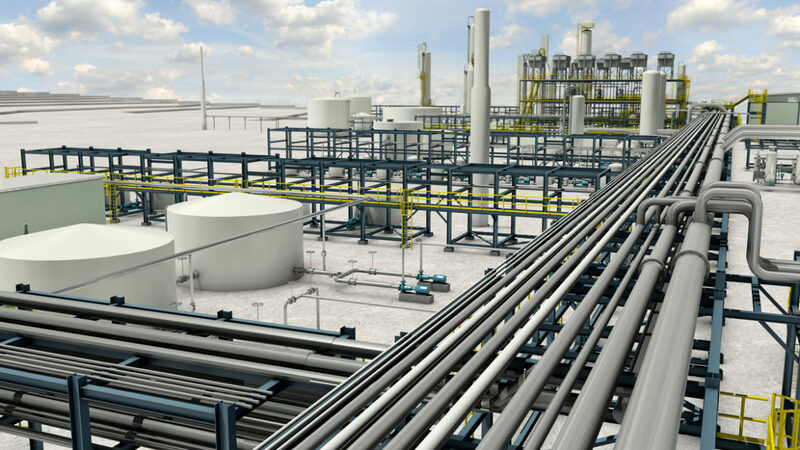 AutoCAD Plant 3D is a comprehensive plant design tool that includes piping and instrumentation design (P&ID) and 3D plant modeling capabilities. 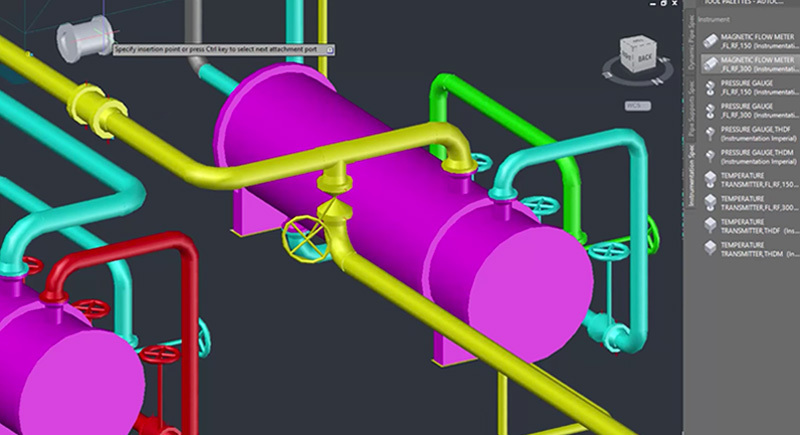 Plant 3D allows engineers to create the schematics that show the functional design of the plant, including process and instrumentation logic (the P&ID) through to the complex and accurate layout of the physical plant, while maintaining a connection between the schematic and the physical model. It offers built-in efficiencies, insight, and automation features, no matter how varied each component of a complex plant layout, whether a small pump or heavy complex machinery. Plant designers begin by creating P&ID diagrams for piping and equipment in Plant 3D which they then develop into a 3D model. With AutoCAD as its software stack and an easy on-ramp to a 3D model, Plant 3D gives engineers who are used to designing in CAD a familiar 3D environment to work in. Plant designers can easily create 3D models from P&ID diagrams for piping and equipment in Plant 3D. Moving the industry to a 3D model workflow especially has brought time- and cost-savings to plant owners and operators everywhere. For Bach Nielson, Engineering Manager at Aalborg Energie Technik (AET) in Denmark, Plant 3D has been essential to meeting the needs of AET’s quickly growing customer base. Plant 3D provides his firm with project controls and a comprehensive overview of their environmentally-friendly biomass plants from start to finish, enabling them to work with precision. By definition, our plants are mission critical, since thousands of people in one town often depend on our plants to deliver heat and energy,” he says. Plant facilities are designed by multiple and diverse stakeholders. Whether the architect, structural and MEP engineer, plant designer or project specialist, this assorted design team needs a centralized space to easily share important project information with each other and other non-design stakeholders like the project owner. Many design teams work in a high-trust environment, concurrently working with the latest, most up-to-date information in a shared 3D model. This helps speed up design iterations and bring everyone on the same page. Autodesk has been leading industry transformation with the principle of “Connected BIM” for faster, more efficient project delivery. In keeping with these trends, Plant 3D now allows 3D project files to be shared in the cloud by multiple project members no matter their location using BIM 360 Team, the design collaboration software from Autodesk. Simply upload your project by clicking the “Share Project” button in the Collaboration tab. For customers used to sharing project data on a WAN/LAN, this takes set-up time down to zero. Instant access: Collaborate from anywhere at any time using Plant 3D on your mobile device, laptop, or desktop (for mobile devices, download the BIM 360 Team app). Search functionality in “Project Manager”: This is a major time saver for projects with tight deadlines! Just type in the name of the file you are looking for, hit search, and those files will appear in the project pane. Model in real-time: Using Plant 3D, you’ll have real-time access to the same shared BIM model in the cloud which means you’ll be working on the latest information at any time. Check files in and out: With similar functionality to Vault, you can lock files so no one else can edit them by checking them out, and check them back in when complete. This way, you can ensure that real-time changes are being made by one person at one time in the shared model, preventing confusing overlaps. With the ability to share drawings and Plant 3D models easily in the cloud, you can invite experts from anywhere in the world to your project hub for input and review. Virtual co-location can greatly reduce travel time and expense. If there is crucial information your design team needs to hear or pass on to you, cloud collaboration and communication tools make it easier than ever. Simply leave notes in markups (which save a snapshot of the model view at the time of markup) in BIM 360 Team and follow the conversation to ensure resolution. Design intent is important to ensure owner satisfaction with project outcomes. You can share design intent documents and other critical project information with the entire team using BIM 360 Team project wikis. These reference docs will help clarify questions and doubts that you won’t need to answer repeatedly. Host design review, especially with extended stakeholders. BIM 360 Team’s “live review” feature is a great way to host a common design review session for all on your team, including other stakeholders like the project manager or owner. This is a good time to walk through design decisions and recap progress. Connected models offer greater flexibility and lesser rework. If you need to change a standard piping component for the entire plant or redo flows to match new cadastral data, Plant 3D will apply this update to the model and indicate/help you resolve clashes. By worksharing in the cloud, you can upload and download the most up-to-date model wherever required. With increasing project complexity, budget constraints, and pressures to deliver quickly and reliably despite tight deadlines, it is important now more than ever to use technology to beat the competition. Cloud collaboration with Plant 3D offers easy and intuitive storage and worksharing solutions that ultimately help you save time and take your dollar further. Learn more about cloud collaboration for Plant 3D here. AutoCAD Plant 3D is also part of Autodesk’s AEC Collection, the essential set of BIM tools you’ll need to for successful project delivery. For additional information on BIM for Plant Leveraging the Cloud in Plant 3D 2018, see release notes.